Everyone has different ways of absorbing information, and the audio-visual nature of video works well for many. The barrier to entry of video making is getting lower and lower, so many individuals are making video clips with their phones and uploading them directly to YouTube within minutes… it makes sense that we’re starting to gain access to the thoughts, wisdom and experience of professionals and experts we would otherwise have no access to. And we hear it in their own voice. Here are ten top writing videos, each of which has the opportunity to transform an area of your freelance writing work. Want to find new freelance clients? Hoping to write and self-publish your book? Desperate to stop procrastinating and get on with your work? There’s something for you on this page of videos for writers and other self-employed freelance professionals. Writers need a constant inflow of new ideas, and sometimes the stream can run dry. This awesome video by Brad Herzog tells you how to get ideas from mundane tasks like eating and fishing. Listen to Byron White and Matt Grant discuss tips and techniques for getting clients and work that pays well. Writing great headlines is more important than ever in this age of social media, where we need to grab our readers’ attention in the midst of a busy timeline of posts competing for their attention. Check out what Leo Babauta from Zen Habits has to say about it. Ok, maybe loathe is too strong a word (or is it?) but, in this video, the extraordinary Denise Duffield-Thomas tells you, in no uncertain terms, how to fire the clients who are dragging you down. James Reavis has some interesting ideas on autobiographical writing. 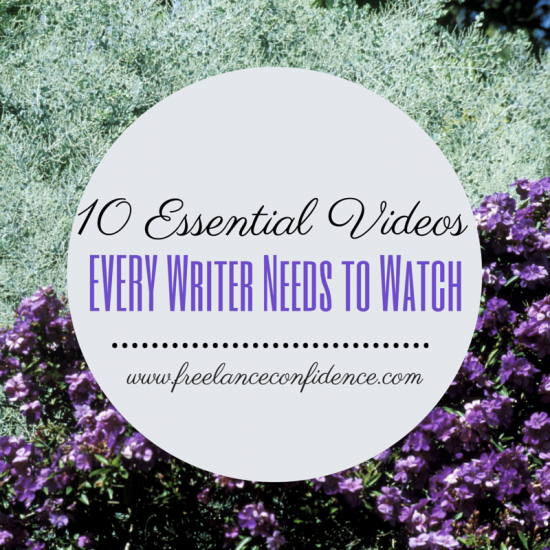 Share the post "10 Essential Videos EVERY Writer Needs to Watch"
Are your freelancing rates fair?